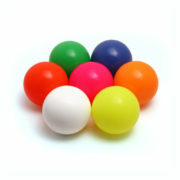 The Sil-X ball is 1/3 filled with a non-toxic liquid silicone. The liquid silicone filling, unlike any kind of grain, slides perfectly inside the ball so that even when the ball is thrown with a spin it does not wobble in the air. When the ball is caught the balls’ filling goes to the bottom of the ball and make is easier to catch or to balance. This feature makes the Sil-X ball highly suitable for high throws and easy for foot catches and head rolling/balancing. The Sil-X ball construction minimises any bouncing or rolling when dropped. Moreover, the liquid silicone is injected through a very small hole in the rotary moulded exterior, which allows for an almost invisible plastic tapered pin as a plug. The PVC exterior has a solid and striking colour, which is also UV reactive.